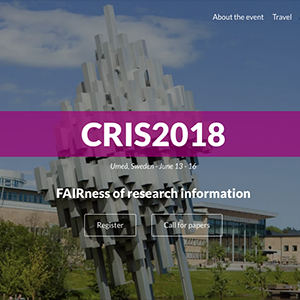 CRIS 2018 is the fourteenth edition in a biennial series of conferences devoted to improving the availability of and access to research information across Europe. The target audience includes managers of research-performing and/or funding institutions, evaluators, librarians, ICT experts, as well as policy makers. euroCRIS is a non-profit professional association ofCRIS experts and custodian of the Common European Research Information Format (CERIF). On Campus Umeå all academic disciplines, courses and programmes, and study environments are within walking distance of each other. These are manifested in the two higher education institutions situated at campus. Umeå University, a full-service institution with it’s 30000+ students and SLU -Swedish University of Agricultural Sciences – develops the knowledge about how to use natural, biological land and water resources in a sustainable manner.